I love masks! Both DIY and organic sheet masks,clay,mud and probiotic mask. Here is a great recipe and I hope you enjoy it! You can sub out pomegranate for blueberries. And it becomes a anti-aging mask! Ingredients:Handful of pomegranate seedsjuice of half a lemon Directions:To a food processor, add the pomegranate seeds and pulse on high until a smooth, paste-like consistency forms.Scoop pomegranate paste into a small bowl, and squeeze the juice from half a lemon. Stir well.Apply the mask to clean skin and leave on for 10-15 minutes.Rinse off and pat dry.Use twice a week to prevent acne, deep clean skin, and prevent wrinkles & fine lines. 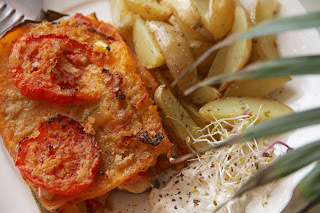 For today we have a delicious and super healthy recipe, this butternut squash lasagne. I like to mention that a vegan lasagne was the first recipe I ever posted on here. Gluten-free featuring vegan cheese and heaven on earth, here is the recipe. Jesses lasagne is a lot healthier but just as good. Take a medium sized glass baking pan and grease it with olive oil. Chop your vegetables any way you want, but if you want this dish to have a lasagne like feel try and thinly slice them just like the Butternut Squash. Now layer them onto the baking dish, starting with the squash, the Courgette and then the tomatoes. Zosia Beauty Serum: My Review plus a 20% off coupon!!! Hello Foodies or Fellow Pescatarians! Today I am making a Valentines meal in our hotel room in the InstaPot. I will make lobster with ghee, skillet steak and mashed potatoes with peas. Simple yet easy and good. Here is the recipe I used for my InstaPot!